Note: Since December 2001, treated sapphires from Thailand have created a great deal of controversy (see ‘Questions About Treated Sapphires from Thailand’ and ‘Understanding the New Treated Pink-Orange Sapphires’ for full details). The evidence is now overwhelming that such stones owe their color to a form of outside-in diffusion of coloring agents. This process is basically the same as that used with lattice diffusion treated blue sapphires in the past, but with different chemicals. Both the AGTA and GIA labs are now labeling this treatment process “lattice diffusion” and that information will be clearly listed on their identification reports. October 2001, Australian gemologist Terry Coldham informed the author of a new treatment for orange sapphire. His initial report was that a burner in Chanthaburi, Thailand had developed a new method to treat off-color Songea (Tanzania) stones to a fine orange to red-orange color. Shortly thereafter, several other sources confirmed the news and on Nov. 16 2001 we sent out an e-mail alert. The stones were to be marketed under new names, such as Sunset sapphire, etc. 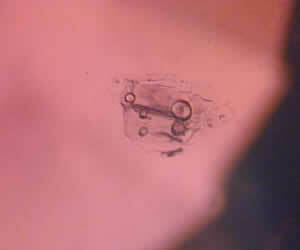 AGTA Lab Director Ken Scarratt visited Bangkok in December 2001 and obtained samples. Pala International’s Bill Larson also purchased samples of these stones last December in Bangkok. When Scarratt examined his stones back in New York, he found that all had been exposed to high-temperature heat treatment. But many displayed features suggesting there might be more to this than a simple bake job. Unusual orange color rims surrounding pink cores. 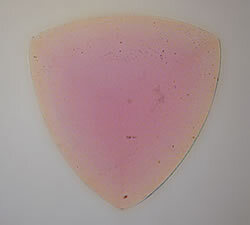 An unusual characteristic in many stones is a surface-based orange color layer surrounding a pink core (see photo below). Superficially, this resembles lattice (formerly termed ‘surface’) diffusion (see box below), but unlike previous lattice-diffusion treated gems, the facet junctions and girdle show no highlighting. Instead, what is seen is a layer of yellow-orange that follows the shape of the cut stone exactly. This suggests that at least the final portion of the treatment is applied to the cut stone, rather than the rough. It also suggests something being added from outside, because if it was simply a heat treatment acting upon elements already within the stone, the internal color pattern would not follow the shape of the cut stone exactly. There is no mine that produces rough orange sapphires in a perfect trillion shape (see below). Initial reports suggested stones were possibly undergoing irradiation and that the color was unstable, fading with prolonged light exposure. However, the GIA’s Shane McClure pointed out that such irradiation would not color an entire stone’s surface equally, which is what appears with many of these new stones. Reports on fade tests have also resulted in no loss of color. Thus we can safely scratch irradiation as a possibility. Reports from two Thai labs pointed to an alteration of the valence state of iron from Fe2+ to Fe3+ and overall Fe content as the possible cause of the orange rims. Discussions here in America suggest this is probably not the case. According to John Emmett, former Associate Director for Lasers at Lawrence Livermore National Laboratory, and one of the world’s top experts on the chemistry and physics of corundum, for iron to produce a yellow color in corundum, iron substitutions on the order of 2–3% are required. To the best of our knowledge, this is not being found in the pinkish orange stones with color rims. Again, John Emmett dismissed it, stating that corundum is essentially “isothermal,” meaning that it conducts heat so well that there is no significant temperature difference between the skin and center of a gem. Of the major gems, only diamond and silicon carbide have better thermal conductivity than corundum. With x-ray, iron, steak and fake discredited, it was left to John Emmett to explain. At the Tucson meeting, he described the most likely cause of the orange color rims as outside-in “lattice-diffusion” of a trapped-hole color center-producing ion. Such an element could be any small, light, allovalent ion from the upper left corner of the periodic table. Likely candidates are magnesium (Mg2+), beryllium (Be2+), calcium (Ca2+), lithium (Li1+), sodium (Na1+) or potassium (K1+). Even things like copper (Cu2+) and silver (Ag1+) could be involved. According to John Emmett, at high temperatures the diffusion process draws elements present on the surface of the stone into the stone. At the same time, when this process is conducted in an oxidizing atmosphere, point defects called “holes” (which are the absence of an electron) are also created on the surface, and they diffuse much more rapidly throughout the stone. If some of these holes are trapped by the beryllium , magnesium, etc. which has diffused into the stone, they create what is called a “trapped hole color center.” In corundum, the trapped-hole color centers create a strong yellow coloration. This yellow coloration in a stone with a pink body color creates an orange coloration. However, not all stones will react the same way during this treatment. If titanium or other tetravalent impurities are present, they can bind with the magnesium or beryllium in such a way as to prevent formation of the trapped-hole color centers. Thus the relative amounts of the diffused-in element, and all the other impurities naturally in the stone, will determine the final color. This explains why individual stones react differently to the treatment. A second problem is that, again according to our current understanding, so little of the allovalent ion may be required for this treatment that burners may not be aware that they are lattice-diffusing these stones. At the suggestion of John Emmett and Intel’s Gene Meieran, just before the Tucson 2002 Gem Fair the GIA subjected three different cross-sectioned samples to Laser Ablation Inductively Coupled Mass Spectrometry (LA-ICP-MS) and Secondary Ion Mass Spectrometry (SIMS) analyses. The GIA’s Shane McClure presented the results of the tests at the Tucson meeting. While LA-ICP-MS turned up nothing unusual, SIMS analysis revealed unusually high amounts of beryllium (Be) in the orange color layer. 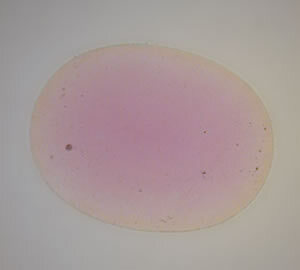 Since Be is not normally found in corundum, and since the elevated Be levels of the skin were not found in the pink cores of the tested samples, the evidence is quite strong that, at least in some samples, the skin color appears to be due to lattice diffusion of light allovalent ions to create a yellow-producing trapped hole color center. The GIA’s findings can be viewed at this link. Do we need new nomenclature for these stones? I don’t think so. Why should we invent a new name just because some stones were initially misidentified? Our current nomenclature will suffice. In solid-state physics, that which we gemologists formerly termed “surface diffusion” is referred to as “lattice” or “bulk” diffusion. This separates outside-in movement of light elements like hydrogen from similar outside-in movement of heavier elements like titanium, chromium and magnesium. It’s not a question of how deep the penetration, but more a question of what is going in. The use of the term “lattice” (formerly ‘surface’) diffusion” in gemological nomenclature is an attempt to separate treatments that influence colorants already within a gem from those that introduce new colorants from outside. This relates to rarity, because treatments that depend on colorants already within the gem are limited in the changes they effect. In contrast, treatments that involve outside-in movement of coloring agents (lattice diffusion) have far more leeway in the changes they can effect. Given a gem canvas that is relatively pure and light in color, treaters can theoretically paint color at will. This begs the question: when human intervention becomes such a large part of a gem’s apparent quality, why mess around? Why don’t treaters just get busy producing a full synthetic? Over the past twenty years, a number of controversies similar to this have occurred in our trade. In the late 1970’s and early 1980’s, it was the appearance of heat-treated rubies and sapphires (Hughes, 1995). Producers originally sold them as completely natural. When it became understood that the stones had been heated, they fought tooth and nail to avoid the disclosure of those treatments. Today disclosure is the norm. In the early 1980’s, the first lattice-diffusion treated blue sapphires appeared. Producers initially sold them as natural, later as simply heated. Today, full disclosure is the norm. The mid-1980’s saw Thai/Cambodian rubies with glass-filled surface cavities appear (Hughes, 1984). Again, initially sold as natural. Today, full disclosure is the norm. By the late 1980’s, a second-wave of lattice-diffused stones appeared, with just a little color added on already blue stones with color zoning problems (Hughes, 1988, 1991, 1992). Producers initially denied the treatment, stating that stones had received only “surface heating.” The world’s labs did not accept this explanation. Today, disclosure is the norm and, in this particular case, such stones have largely disappeared from the market. In the early 1990’s, rubies from Möng Hsu appeared. Originally they were sold as simply heated. When glassy residues were found, producers stated this was just a byproduct of heating. It was later shown that such stones were deliberately heated in fluxes to heal their fractures with what amounts to synthetic ruby (Hughes and Galibert, 1998; Emmett, 1999; Hänni, 2001). Even today, some try to deny what is done to these stones, while many others do not fully understand it. But disclosure is becoming the norm. Déjà vu. Based on the historical record and current evidence, it appears only prudent to go slow with these stones. A man’s eyes should be torn out if he can only see the past. We used to believe in magic. We thought that everyone could get rich by making silk purses out of sows’ ears. But we failed to see into the future. We rubbed the magic lamp, the enhancement genie appeared, but now he’s turned on his master. And suddenly we’ve decided that we don’t believe in magic after all. I still believe in magic. I still remember the magic that holding a fine Burma ruby first brought. Today my daughter is five years old. I hope that when she is my age, she still believes in magic. I hope that when she holds a fine gem, she holds a silk purse, not a sow’s ear. Maybe it’s that time again – time to look ahead to what the future might hold – and time to prepare for that future. Hughes, R.W. 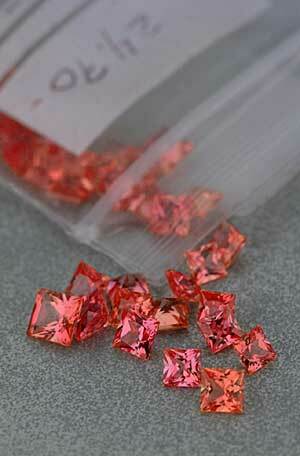 (1984) Surface repaired rubies – a new gem treatment. Jewellery News Asia. Hughes, R.W. (1991) There’s a rumble in the jungle – The sapphire face-lift face-off saga. Gemological Digest, Vol. 3, No. 2, pp. 17–31. Hughes, R.W. (1992) Devil’s Advocate: Vampire blues: deep-diffusion treated sapphires. JewelSiam, No. 3, May-June, pp. 83–86. Mohapatra, S.K. and Kröger, F.A. (1977) Defect structure of alpha-Al2O3 doped with magnesium. Journal of the American Ceramic Society, Vol. 60, No. 3–4, pp. 141–148. Schmetzer, K., Bosshart, G., Hänni, H. (1983) Naturally-colored and treated yellow and orange-brown sapphires. Journal of Gemmology, Vol. 18, No. 7, July, pp. 607–622. About the author. Richard Hughes is the author of the classic Ruby & Sapphire. He can be contacted at: rubydick@ruby-sapphire.com, or through his personal web site, Ruby-Sapphire.com. Acknowledgments. This article could not have been written without the generous help of the following (in alphabetical order): Jeff Bilgore, Edward Boehm, Kriengkrai Chiaraput, Terry Coldham, Richard Drucker, John Emmett, Josh Hall, John Koivula, William Larson, Gabrièl Mattice, Shane McClure, Gene Meieran, Yianni Melas, Roland Naftule, Karen Palmer, Visut Pisutha-Arnond, Stuart Robertson, Gary Roskin, Ken Scarratt, James Shigley, Arnold Silverberg, Mark Smith, Maha Tannous, Vichian Veerasaksri, Pornsawat Wathanakul, Robert Weldon, Ray Zajicek and Urs Zwyssig. Afterword. This article will be appearing in the next issue of The Guide (2002, Vol. 21, No. 2, March–April). This web edition contains material and updates not found in the print version. Note. The title illustration is a gem stylistically altered by the author in Photoshop. It is not one of the treated orange sapphires discussed in the article. For the following description of diffusion in corundum, we thank John Emmett of Crystal Chemistry, Brush Prairie, WA. But please note that the account should be thought of as preliminary only, since Mr. Emmett has not written this himself. In other words, all mistakes are mine, not those of Mr. Emmett. Over the years, a number of claims have been made regarding heat treatment. Perhaps the most common is that “nothing is added” during heat treatment. Current scientific evidence simply does not support this idea. Corundum is made up of Al2O3, with the aluminum in the Al3+ valence state. Impurity elements with the same valence, such as Cr3+, Fe3+ and V3+ will easily and happily substitute for Al3+ in the corundum structure. These elements require substitutions in the 0.1–3% range to produce significant color in corundum. Another type of coloration, however, is caused by color centers, and it requires far smaller amounts of impurities. In these cases, allovalent ions such as Mg2+ and Ti4+ are involved. When an allovalent ion replaces Al3+, the fit is not so happy, and defects are created which absorb light. The most important situation is where lower valence ions (such as Mg2+) are present in larger quantities than higher valence ions (Ti4+). When this requirement is met, yellow-producing trapped-hole color centers can result. But what if your stone does not have the needed allovalent ion? You can diffuse it in from the outside. While diffusion rates for Cr3+, Fe3+ and V3+ are agonizingly slow, allovalent elements such as Mg2+ and Ti4+ diffuse into corundum some 10,000 times faster. Thus it is possible to add significant color to corundum, via diffusion of tiny quantities of allovalent ions from outside. How much is needed? It may be as little as a few tens of parts per million. Such traces are virtually undetectable with the types of instruments found in even the most well equipped gemological labs. In some cases, burners may be diffusing allovalent ions into their stones without even realizing it. Indeed some fluxes commonly used in burning (such as borax) may contain traces of Mg2+. Other allovalent ions that can possibly produce this effect include lithium, beryllium and sodium. When Ti4+ is diffused into corundum to produce a blue color, it moves in quickly until the point where it meets Fe ions. At that point, bonds are formed with Fe and the diffusion generally ceases. This is why we often find a sharp blue boundary between a diffused zone and the colorless core in lattice-diffusion treated blue sapphires. Mr. Emmett has done controlled burns of Ti lattice diffusion with sapphires of varying Fe contents that confirm this effect. Penetration of blue color is more diffuse in stones of lower Fe content. With stones of higher Fe content, a sharper boundary is found between the blue diffusion skin and the crystal core. Further details of the diffusion process can be found in Chapter 6 of my book, Ruby & Sapphire. Much of that material is based on discussions with John Emmett. Thus I would like to again thank him for his help. One method by which heat treatment produces changes in color is via diffusion. For diffusion to occur, lattice defects are required; the best way of creating such defects is via heating, as defect percentages increase with temperature. Diffusion rates vary according to the elements involved and their valence. Allovalent titanium (Ti4+), magnesium (Mg2+), lithium (Li1+), beryllium (Be2+), calcium (Ca2+) or sodium (Na1+) diffuse into corundum some 10,000 times faster than either Fe3+ or Cr3+ because replacement of Al3+ by an allovalent impurity stimulates formation of defects (John Emmett, pers. comm., 27 June, 1994; 15 Jan., 2002). While John Emmett is not one to blow his own horn, allow me to elaborate a bit on his background. From 1975–1988, John was Associate Director for Lasers at Lawrence Livermore National Laboratory in Livermore, CA. It was here that he first began researching corundum, something that continues to this day with his own company, Crystal Chemistry, Brush Prairie, WA. While at Lawrence Livermore, the programs involved over 1500 researchers, including 300 Ph.D.’s, and in 1988 alone were funded at US$250 million. He has authored over 50 papers published in peer-reviewed scientific journals. John is considered a world authority on the physics and chemistry of corundum and has for years been involved in heat treatment. Such stones have largely disappeared because the market decided it would pay more for a heated sapphire with zoning problems than a lattice-diffusion heated sapphire with no zoning.